VNC Crew 1-1 & 1-2 are Type 1 hand crews organized and trained by the Ventura County Fire Protection District (VCFPD). There are approximately 20 members, both civilian and sworn seasonal fire control workers. Each crew has a leader and a superintendent. All crew members are trained in the basic use of hand tools such as a pick, Polaski, Mcloed, fire rake, shovel and chain saw. The crews promote a team concept and work by under a “Committed to excellence…Delivered with pride” motto. Crew members will commit to a 4 day work week, from 0800-1800 hours, with every other weekend off. Time commitment will change if the crew is dispatched to an active fire, as the crew will be released based on incident need. Crew transportation is provided during daily operations to specific areas to complete designated work assignments, or to emergency incidents, in and out of Ventura County. VCN Fire Crews are part of an available pool of resources, eligible to be dispatched throughout the state of California. 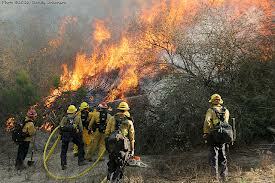 Must complete basic fire course’s; S-130 Firefighter Training, S-190 Intro to Wildland Fire Behavior.